Select one of the drop downs to view information about the Hollis Center policies. It is required that all Stetson students/faculty/staff/alumni provide their Stetson University Identification Card to gain access to the Hollis Center facilities as well as all Wellness & Recreation programs. All Wellness & Recreation staff are fully authorized to deny entrance to the Hollis Center in the event someone does not present a valid ID. Users must be 16 years of age or older, unless accompanied by an adult, and must provide proof of age upon request. 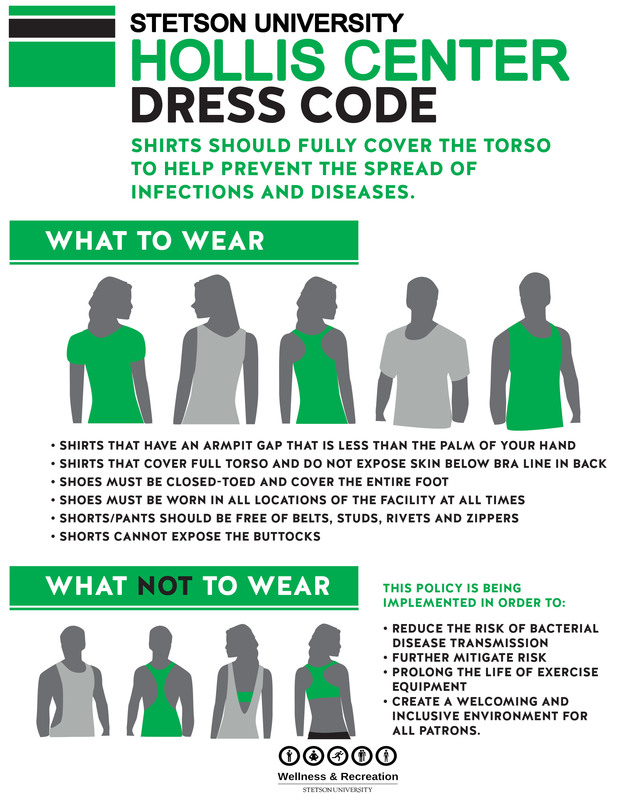 Shirt and shoes must be worn at all times in the building (see specific guidelines in all activity areas). Smoking and tobacco use of any type are not permitted in the Hollis Center. Alcoholic beverages are not permitted in the Hollis Center. Florida laws and Stetson University policies regarding illegal substances will be strictly enforced. Food and drinks are permitted only in the lounge and classroom. Food and drinks are not permitted in other activity areas, except for beverages in closed plastic containers. Personal radios are not permitted unless used with headphones. Bicycles, skateboards, roller skates, and roller blades are not permitted in the building. Animals are not allowed in the facility unless they are specifically trained to aid in the mobility of their owners. Hollis Center staff will not be responsible for lost or stolen items. All participants are asked to follow the guidelines outlined in the policy below when using any fitness space in the facility, including, but not limited to the weight and cardio rooms, aerobic studio, spin studio, and Rinker Fieldhouse. Users must be 17 years of age or older and must provide proof of age upon request. All users must bring a clean towel and wipe off equipment after use. Appropriate workout clothes and athletic shoes must be worn in the Fitness Room. Shirts should cover the entirety of the torso. Dress shoes or cleats are not permitted. Sandals, bare feet, and stocking feet are not permitted. User time on each piece of equipment is limited to thirty (30) minutes when someone is waiting. Users must return bars/weights/pins to proper place/rack after use. Weight belts are not permitted on exercise equipment where the belt buckles make contact with the upholstery. Animals are not allowed in fitness spaces unless they are specifically trained to aid in the mobility of their owners. Personal property such as books and backpacks should be stored in the lockers provided. Personal items may not be taken onto the Fitness Space floors. Users work out at their own risk. If you have questions about the use of any piece of equipment, please ask a staff member for assistance. Users must be 16 years of age or older, unless accompanied by an adult, and must provide proof of age upon request.  Shower before entering the pool. Disorderly conduct and disruptive behavior (dunking, fighting, profanity, etc. will not be tolerated at any time). No spitting in water, blowing nose or discharging bodily waste into the pool. Towels and slippers must be used when exiting the pool area. No hairpins or clips allowed in the pool. Swimmers must leavthe e pool when the air horn sounds. All lounge furniture must remain on deck area. Food and drinks are not permitted except for beverages in closed containers. Animals are not allowed on the pool deck or in the pool unless they are specifically trained to aid in the mobility of their owners. Users must be fully clothed before re-entering the facility. Hollis Center staff will not be responsible for lost and stolen items. All Hollis Center users are expected to be responsible, courteous, and safety conscious at all times. Users who disregard policy will be asked to leave the facility and may be suspended from use of Hollis Center. All users of the Hollis Center must present a valid Stetson University identification card (with date indicated) for admission to the activity areas. Stetson Alumni may use the Hollis Center by obtaining a current ID card from the Alumni Office at 822-7480. Guests must be accompanied by a student, alumnus, faculty or staff member at all times. Guests must exchange a valid photo ID for a guest card and sign in at the Hollis Center information desk. The number of users admitted to the facility may be restricted, based on facility demand. All Hollis Center users and guests must sign a waiver before using the facility. Conduct of Hollis Center Users: All Hollis Center users are expected to be responsible, courteous, and safety conscious at all times. Students are expected to abide by the Stetson University code of conduct. Disorderly conduct, abuse or misuse of the facility and its equipment, or disregard for Hollis Center policies will not be tolerated. Users who disregard policy will be asked to leave the facility and may be suspended from use of the Hollis Center. All guests must be accompanied by a student, alumnus, faculty or staff member. Guests must check in at the information desk in the lobby, present a photo ID, sign a waiver, and be issued a guest card. The guest card is for use within the Hollis Center. The card is not applicable for other University facilities or programs. Hollis Center users must be 16 years of age or older, unless accompanied by an adult, and must provide proof of age on request. Students, alumni, faculty or staff are responsible for the conduct and actions of their guests and must accompany them at all times. A student, alumnus, faculty or staff member may bring a maximum of three guests at one time. Dependents are not permitted to bring guests. Guests may not check out equipment. Students, alumni, faculty or staff must check out and be responsible for equipment used by their guests. Individuals seeking admittance to the Hollis Center may not solicit members to sponsor them as a guest.